“I’ve been very pleased with my Rido saddle, and have been recommending it to all my friends! I’m a triathlete and currently have the saddle fitted to my training/commuting bike, so use it 4 days a week for 2 hours and I can’t decide which is more comfortable, the saddle or my office chair! “Love my saddle! I have a box of saddles, none of which satisfied me. Yours is by far the most comfortable. Waiting for the weather to clear so I can do a long ride,but you’re right: the longer I ride the more comfortable it gets. Thanks! 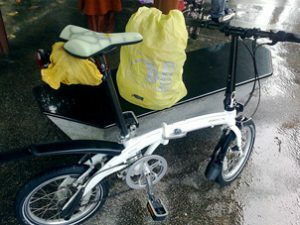 “A quick note to say how much I like the Rido … I have this saddle on three folding bikes I use for commuting. My comment is interest in a lighter weight Rido … something <200g. This model would cost more, but there is certainly a market and an opportunity. I just rode the Spyder for the first time and it’s indeed surprisingly comfortable for such a minimalist structure; but not half as comfortable as Rido! 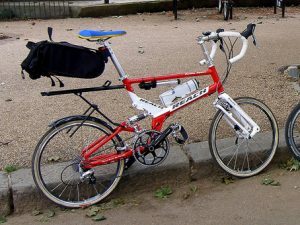 “I swapped the (Brooks) saddle on mine for the gel saddle from my old touring bike. 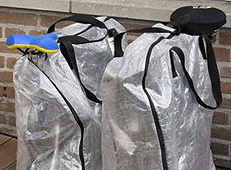 That was fine for short rides, but would cause problems on a 200 mile tour we did in the summer. Combination of heat, sweat and friction – you know the story! 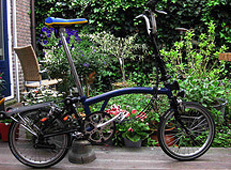 “I bought the Rido saddle to replace the original standard saddle supplied with a Brompton bike recently purchased. I did not find the Brompton standard saddle very comfortable. “Just yesterday, I completed 17 miles light of 800 miles from St Malo to Bezier in 11 days. I felt it was a creditable performance from a 60 year-old! 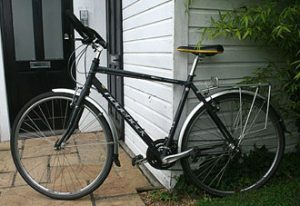 “I have a Ridgeback Meteor model from late 2007 which is a decent hybrid bike. 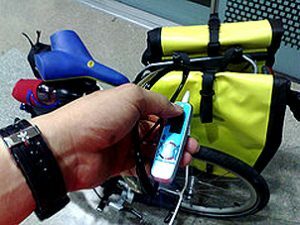 It’s expensive enough to be robust and have quality components, but not expensive enough to be the first bike in the rack targetted by thieves. “I have made a couple of modifications to the standard kit. I replaced the riser handlebars with butterfly bars as I feel they are the most comfortable thing for sustained journeys, offering a number of different hand positions to switch between. These weren’t all that expensive, maybe £30 including the bar tape. “I found the kit saddle extremely uncomfortable. The padded insert became less and less firm over time, offering little protection for an important part of the body! I replaced it with a Rido saddle. Even though it’s hard plastic, it’s very comfortable and shifts the pressure to the correct part of the body for sitting. This saddle is the original model, and Rido have since brought out a fancier R2 model. “Very impressed by your saddle. A four hour cycle yesterday from West to East London and back through heavy traffic. Found it very comfortable with absolutely no ill effects today. “Please send me an R2 saddle as soon as they’re available. “I have them on both my road bikes. Love them very much. I got the black ones, although they still have a little yellow stripe on the bottom which I’m not real fond of. But hey, when you’re on the bike no one sees it anyway. VERY comfy – but saddles are so different for everyone, you just have to try it out and see if it works for you. The nice thing about Rido is that they are cheap compared to most any other performance saddle. You really can’t go wrong if you end up not liking it. Well, I’m happy to inform that I’m very satisfied with my new saddle. It is everything you promised. I use my bike for long distance touring and running errands around town. I’ve put close to 80 miles on the saddle, including a 40 mile one day tour and I haven’t had any pains in my crotch area. As a matter of fact I had stopped riding for a few weeks to allow pain to go away. The pain went away but I didn’t dare get on the bike until my Rido saddle arrived. I know my old saddle would’ve killed me with pain. I jumped back on the bike with the Rido and the pain has stayed away. I’m confident enough of the comfort that I’m planning tours to San Diego and San Francisco from the L.A area – something I would’ve never dared with the old saddles. “I’ve got a racing style Specialized ‘Body Geometry’ saddle on my triathlon race bike and I’ve been having a few painful posterior problems in a few of my longer recent races. I have been using one of your Rido saddles on my commuting bike for months now and so yesterday when I was competing in a Half-Ironman triathlon I decided to put the Rido saddle on my race bike. “Please reserve one R2 saddle for me. “Put me down for one of the new R2 saddles. “After buying five of the MkI saddles I was interested to read about the MkII version. “I will reserve an R2 please. “Je voudrai acheter une R2. Comment faire? Je roule avec ma vielle rido 1er generation encore en attendant sportivements. “I’m (the) happy owner of two rido saddle for my road bikes.No crotch numbness.Throw to trash all Sell Itallias, Arione, Turbomatics, Prolinks, etc. “I wanted to feedback my satisfaction with your Rido “original”. Due to a prostatectomy and related radiation therapy 4 years ago, I have had trouble with bladder control following any type of riding on a “normal” type of saddle. This has been very frustrating to me, particularly since I have long been an active cyclist on long rides, centuries, and time trials (age 69). My experience with your Rido saddle has been a breath of fresh air, allowing rides that are comfortable and non problematic. Numbness, pain, or any type of urological problems are gone. Not only that, but this saddle is COMFORTABLE! I have not yet tried a really long ride, since my lack of stamina requires more training; but I have no doubt that it will be trouble free.